It can be tough for games to max out high-end gaming rigs these days, but it’s also hard to keep those machines cool. The best GPU cooler can take those temperatures down in an instant, but only if you find the right fit and know what to look for when it comes to technical specifications. Whether you need the best AIO GPU cooler or something a bit simpler, there are a number of options to choose from. Well, we’ve taken care of the hard part by finding the best graphics card coolers that cover a variety of builds from mid-range rigs to powerful professional builds. We aren’t going to go through all the different coolers or methods used to keep your rig from running hot. Most GPU coolers simply use air or liquid; each has its own strengths and weaknesses which we’ll highlight below. Blowers – Simply put, these coolers pull air in and blow it out. They are relatively common, and what you’ll see on reference cards from the big two. They get the job done but can be louder than other types of systems due to the design. Open Air – Open air cooling systems are ideal for many builds and typically consist of a heatsink, pipes and a series of fans. They are larger than blower-based GPU coolers, and you’ll want to have a flow of fresh air circulating in your case to get the most use from this system. That said, the results are impressive when properly installed. AIO Coolers – Sometimes referred to as “hybrids” these coolers give you the best of both worlds. They have fans, a radiator, and water block but in a contained system that’s easier to deal with than a liquid cooling loop. An AIO cooler is more expensive than open-air coolers but cheaper than a full liquid-cooled system. Unfortunately, they can potentially fail causing water damage which is definitely a downside. That said, they offer cooling performance other systems can’t match. Even if you’ve already built your first PC and became familiar with all main components, or even with fan controllers, you may run into some compatibility issues with GPU coolers if you don’t look before you leap. Size is an obvious thing to keep in mind as you’ll need to have room for the cooler, and some are geared towards reference design while others are not. Compatibility varies by brand and cooler, so the best advice we can give you is to check the manufacturer’s website. Don’t rely on listings if your card isn’t listed or you’re unsure, go straight to the source. 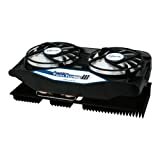 If you follow our site, you are probably familiar with ARCTIC and their lineup of CPU coolers. Their MX grease is a fan favorite, and we think you’ll love the Accelero Xtreme IV Back Side Cooler as well. ARCTIC understands the importance of keeping your rig cool, so they came up with an interesting solution in their patented backside cooler. The design allows mounting without thermal glue, and while it’s not silent, it is very quiet. That’s due to a new fan controller, PWM control, and low noise impellers. As for the tech specs, this system has three 92mm fans with MX-4 compound and a cooling capacity of 300 watts. It measures 288mmm long by 104mm wide with a depth of 54mm. We won’t list all the compatible cards, but popular options from both sides are included with cards like the RTX 2080, Titan X, and the RX 480. This card isn’t quite as fancy as some of our other options, but it performs as advertised and will drop the temps on your GPU card by more than a few degrees. It’s one of the best VGA coolers if your budget is tight and comes with a lengthy 6-year warranty to boot. Now we’re going to take a look at something different, but essential if you depending on your system. NZXT is a name gamers know, and the Kraken G12 is a sure-fire way to take the heat down several notches in your PC. Simple, but effective this cooling unit is designed for Kraken coolers although not limited to them. You can get up to a 40% increase in your cooling from this kit which sports a 92mm fan for active cooling of the VRM and memory no your card. The fan speed is 1,500 RPM with a rifle bearing while the entire cooler measures 201mm x 113mm 32mm. While it comes down to your build in the end, we also feel the G12 is a breeze to install. NZXT engineered the G12 to work with a wide variety of cards in both reference and non-reference designs. That means it will work with more than 40 different GPUs and over 30 liquid cooling systems. NZXT’s coolers are a lock, but so are systems from Corsair, Thermaltake, Zalman, and Antec. As for the cards, NVIDIA covers the RTX 2080 through the old 570 while AMD ranges from the RX 480 to the 5830. The Kraken G12 is available in Black or White, comes with a 2-year warranty and certainly won’t break the bank. While there are flashier options available, there’s a reason this cooler is continually at the top of every build list. ID-COOLING’s name doesn’t ring out like some other companies on our list of the best GPU coolers. You’d be remiss to overlook them however as the Icekimo 240VGA integrated water cooler is an excellent way to keep your rig cool. This system is high-tech but easy to install thanks to a universal mounting kit. It has a large 240mm radiator with sleeved tubing (380mm) that connects to the main unit. The pump itself is rated at 96L/H, and there are two 120mm x 25mm fans on the radiator. Another 90mm fan is set into the anodized aluminum VGA board cover. The Icekimo 240 VGA Cooler is easy on the eyes aesthetically, but the show really starts when the lights go out, and Green LED lighting highlights this cooler on both ends. Tech specs for this cooler include a pump speed of 2,100 RPM and a life expectancy of 50,000 hours. The radiator fans are capable of speeds between 900 to 2,000 RPM while the single unit clocks in at 1,500 RPMs. While we do think this one is easy to install considering its liquid-cooling nature, you’ll want to check the compatibility list to ensure it’s the right fit for your machine. 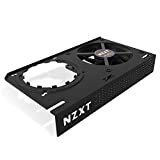 Overall, it’s an option for the best GPU water cooler; just keep shipping times in mind if you’re in the middle of a build as this one ships from the Far East. If you liked what the Xtreme IV brought to the table, but need something a little more discreet, the Accelero Twin Turbo maybe more your speed. It may not have as many fans, but it’s quite capable and considerably shorter. There are more similarities than differences between the ARCTIC’s Accelero coolers, but you’ll save some space with the Twin Turbo III. It has two 92mm PWM fans instead of three which takes the length down to 217mm. On the flipside, it’s wider at 122mm but still retains the same thickness. Those dual fans have a speed between 900 – 2,000 RPMs and draw 2.88 watts of juice. The bearings and shafts are the same, but this model has thicker aluminum 0.4mm fins. You’ll still get five 6mm heatpipes although the maximum cooling capacity on this backside cooler is a bit lower at 250 watts. There’s not much else to say about this GPU cooler as you won’t need thermal glue, it’s ready to roll with its backward design and the pre-applied MX-4. It’s a big step up from those tired old case fans and hard to argue with the price point. While most of the parts in our PCs are made overseas, some take a more direct route to your machine. That’s the case with the RAINJINTEK MORPHEUS II, a VGA cooler with twice the heat pipes and support for two fans. The MORPHEUS II is a bit different from our other picks. The large aluminum and copper heat sink has a mirror copper base and one big VRM heat sink along with 24 RAM heat sinks. The latter ranges from A to E and varies in size while the VRM measures 28mm x 18.5mm x 94mm. RAINJINTEK went with 6mm heat pipes on this model, and there are 12 in all while the cooling capacity is listed at up to 360 watts. This cooler is a little barebones compared to others as there are no LEDs, and you won’t even get fans. It can handle two 120mm fans and comes with a set of clips, but it would have been nice to get a few thrown in given the price. This aftermarket cooler is compatible with an array of cards including the R9 Fury, 1080Ti, 980 and others. Like most aftermarket PC parts, finding the best GPU cooler all comes down to your needs in the end. Every system is different, and you have to take location into account as well if you live in a region that stays warm year round. If you feel we left a cooler of our list that deserves attention, let us know and if you’re looking for a new card to cool, check out our list of the best graphics cards and give your rig a nice upgrade!